It’s been a long, hot summer in North America. I love summer – the warm weather, the less restricting warm-weather clothing, the lighter, brighter warm-weather attitudes – but it also causes me a big problem. Unfortunately – regardless of my 6+ daily glasses of water – I’m the sort of person who’s easily dehydrated. Someone once told me it’s because I’m tall and slender, meaning I have a high surface-to-volume ratio and that my body’s moisture evaporates quickly through my skin. I can’t say how scientifically accurate this explanation is (although I do also have dry skin) but I can’t argue with the end result. For me, dehydration usually takes the form of tiredness and headaches, the latter of which are thankfully cured by a couple of regular strength painkillers. But like overdue library books, dehydration headaches strike me as something of a self-inflicted ailment. One that’s even more easily inflicted in the heat of summer, when I need to drink even more water to compensate for what’s lost through perspiration. Regular readers of my blog will know that I recently spent a week in New Orleans. Temperatures in Fahrenheit always sound worse to me since that scale overlaps the hot portion of the Celsius scale, but 104°F not only sounds hot, it is hot. That’s 40°C, which is hotter than it gets pretty much anywhere in Canada save maybe one freak day in Toronto ever 35 years or so. But if the actual temperature in New Orleans wasn’t bad enough, the humidity was the stuff of nightmares. When I’m out and about on a hot day, I find it really difficult to drink enough water because my water bottle usually goes warm. This is such a first world problem and it shames me to even think my drinking water imperfect in some way. I do, however, try to do my part by not contributing to the commodification of water. I was astounded while in New Orleans by the utter lack of people – both locals and tourists – I saw carrying reusable water bottles. Instead, throughout the day, most people would buy bottles of water, which was sold everywhere, even out of coolers in the trunks of cars on the side of the road. Personally, I despise bottled water. Here in British Columbia where I live, corporations like Nestlé are charged a pittance to extract groundwater, which is a disgrace. Water is not a commodity to be sold to turn a profit; it’s a human right. In New Orleans, no one told me the tap water was unfit to drink. Perhaps people were buying bottled water because they could get them cold. I can certainly understand that desire, although the plastic those bottles are made from is so thin and cheap, in 104 degrees, the water can’t possible stay cold for long. 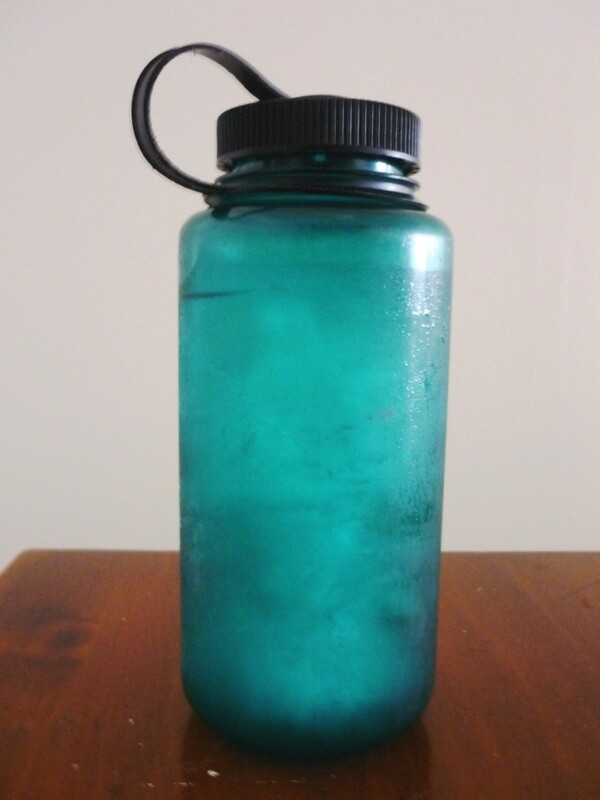 I recently devised a method for keeping one’s reusable water bottle cold all day long in the summer – a method that’s far cheaper than buying multiple bottles of water a day and that only calls for four common household items and two easy steps. A reusable water bottle, preferable one made of fairly hard plastic (I prefer bottles by Nalgene, and in this instance used the 1 liter/32oz size). Even this step alone can prolong the coldness of your water. The trick of freezing it is that although it comes out solid, the ambient heat will slowly melt it, giving you icy water to drink in the process. The problem with just freezing the bottle, though, is twofold: 1) depending on how hot it is outside, it may melt way too fast, and 2) as it melts, condensation will soak whatever else is in your bag, and perhaps the bag itself. Some backpacks have external water bottle holders along the sides, but since they are fully exposed to the sun and heat, they not only made the ice melt even faster, the condensation would drip and run down the back of my legs as I walked. Which made me think, both figuratively and literally, I need a towel. The purpose of the towel is twofold; 1) to absorb the condensation, and most importantly, 2) to provide insulation from the ambient heat and slow the melting process. I usually use a 30x30cm/1x1ft microfiber cleaning cloth. This works really well to absorb the condensation as it occurs and is also long enough to fold up under the base of the bottle to keep that part dry too. I meant to bring this cloth with me to New Orleans but forgot. I didn’t have access to a freezer down there either, but rather only the ice machine in my mom’s hotel. Since ice cubes are smaller than a large block of ice and thus melt faster, I figured I’d need an even thicket insulator than a thin cleaning cloth anyway. My solution: the hotel’s hand towel, which I folded in half width-wise to create a double layer. In the sweltering heat and humidity, it worked even better than I anticipated, remaining cold and dry inside my backpack (yet another layer of insulation) all day long and even into the evening as I sweat my way across the city and its numerous sights. And if anyone looked askance at me for drinking out of a large, towel-wrapped bottle on the side of the road, my lack of dehydration and headache didn’t care one whit. CAUTION: Never fill the neck of a bottle you’re going to put in the freezer. Water expands when it freezes and with insufficient space, it WILL blow the bottom of your bottle off and spill its contents. If your bottle is frozen completely solid coming out of the freezer, let it sit out for 20-30 minutes until you can see a bit of water inside along with the ice (enough water that you can drink at least a trickle of it). Make sure your cloth or towel is dry; damp ones don’t insulate nearly as well. Remember to wrap the bottom of the bottle as well to keep your bag dry and papers safe. If you drink all the water before the ice melts, add a bit more cold water. This will speed the melting of the ice and itself quickly become icy cold for drinking. How do you keep cool in the summer? Let me know in the comments. This entry was posted in Lifestyle and tagged Bottled water, Hydration, Real life, Social justice, Summer, Water. Bookmark the permalink. What an excellent idea – and details. I’ll remember this one. I liked your ability to come up with a replacement solution using locally-available materials (hotel ice and washcloth) when you didn’t bring your cloth. And surviving NO with cold water to drink is an awesome test of the method. In hot Queensland, Australia, you can buy mini thermal containers for your frozen drink bottle. That way, condensation stays on the bottle, not on your paperwork. Also, I use tap water which I filter through a Brita water jug prior to use. Also, another useful tip: during hot seasons with high humidity you probably need to drink 3+ litres of water a day. Start with lemon squeezed in some water on waking and this will start your day off well. These tips have worked for me as I get very dehydrated here in summer. Plus, replace your salts regularly as sweating removes them. Good luck! Thanks for the tips! Yes, lemon water is so refreshing, at any time of the day. 3+ liters sounds about right when it’s hot, but I struggle with drinking more because then I’m always running to the bathroom. My problem is that I go long periods without drinking (because I get caught up in whatever I’m doing and forget) and then try to make up for it by gulping a glass all at once. But this isn’t the proper way to drink; it should be consumed slowly and steadily throughout the day. To combat this, I’ve recently started drinking from a tiny little cup that I’m constantly refilling from a larger bottle (kind of like taking water shots!). You’d have won a prize from a magazine in the old days for that ‘Handy Hint’ Janna 🙂 Here we don’t really get temperature extremes so usually regular water intake is sufficient. On hot days I’m not sure water of any coldness does the trick whereas a cold shower or freezing aircon will. I’m always interested in finding inexpensive ways to solve problems and have a reputation among my peers for being full of “handy hints” (or as they’re more stylishly referred to nowadays, “life hacks”). For me, freezing aircon will do for about five minutes and then I can’t take it anymore. I must have been a reptile in a past life.